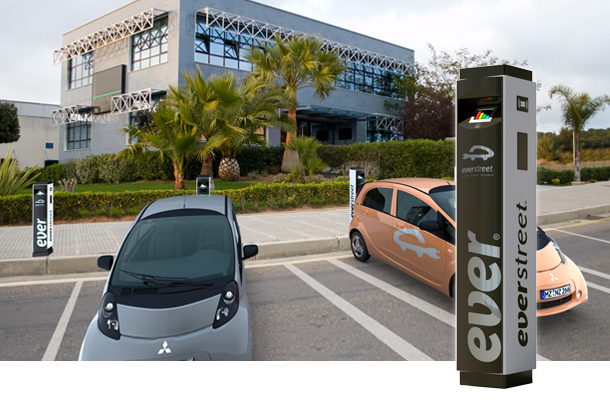 EVERSTREET is a medium speed recharger for electrical vehicles with 230VAC 3,7/7,4kW and/or 400VAC 11/22kW outputs which complies with the IEC 61851 charging protocol. The system is designed for use on streets and public parkings, and consists in an anti-vandalism and anti-graffiti cabinet. EVERSTREET is equipped with a type 2 connector (Mennekes) according to standard 62196. It is also possible to be supplied with a type 3 (Scame) or type 1 (SAE J 1772) connector. EVERSTREET is equipped with a contact-less user identification system (RFID), allowing proper validation, billing procedures and statistical use reports. Optionally, EVERSTREET has the capability to send SMS messages, informing the user when the charging process has finished, and including a brief report of the recharge data. · Integration of an EVERSTREET equipment in an EVER network.